Come Enjoy the Experience of a Lifetime! We operate a full-time junior sailing academy located on beautiful and prestigious Hilton Head Island, South Carolina. We believe in a well balanced approach to our junior sailing academy students, as well as life lessons, and a dedication to the well-rounded success of your son or daughter is our ultimate goal. Our team of highly experienced sailing coaches provide individual training and focus on each and every student who attends our sailing academy and school. A key differentiating factor of our boutique junior sailing academy is that our students have an opportunity to compete in regattas throughout the southeast. This opportunity further develops the skills and confidence of each and every student and helps with collegiate exposure. HHIJSA offers a Full-Time Sailing Academy, Sailing Camps, and Gap Year or Post Graduate Year programs to help a student who wants to focus on sailing for the year building their resume by competing in national ranked regattas. 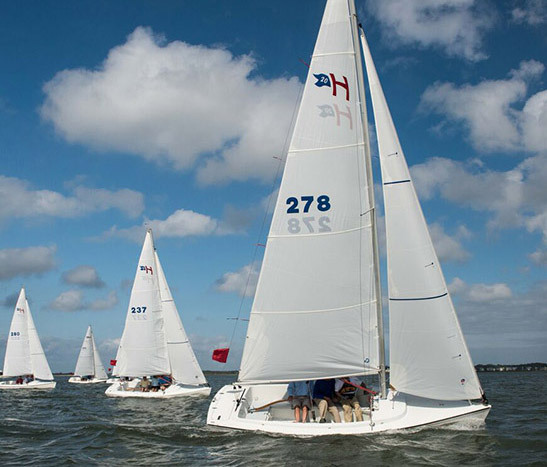 Our focus at the Hilton Head Island Junior Sailing Academy is on five key areas of short course dinghy racing; pre-race preparation, starts, first shift, finish, and post-race debrief. These five areas along with the polishing and perfecting of the basic skills of sailing will produce fully-equipped dinghy sailors. The development of accelerating roll tacks, large fleet starts, teamwork, and the rules of sailing will be the cornerstone to the development and growth of competitive sailors. Learn to sail on beautiful Hilton Head Island from professional, and compassiosnate instructors who provide fun, stress-free, but challenging activities to get your water legs and hone in on your personal advantages so you'll be a natural!